LASER is an acronym for Light Amplification by Stimulated Emission of Radiation. A laser beam is an intense, highly directional beam of light. Lasers are used in many modern industries today, but injuries do happen. Laser training is very important if you use lasers in your career, or would like to. If you are interested in working with lasers, you need laser safety training. Depending on the type of laser being used for a specific application, you can be exposed to caustic fumes and gases, molten metal, liquid chemicals, and the light radiation created by the laser itself. Humans are sensitive to the output of certain lasers, and exposure can cause damage to the eyes and skin. Laser injuries are much more likely to happen when the person using the laser isn’t trained in their safety or how to use them properly. Laser safety training teaches how to use lasers safely in different applications and how to avoid injuries. CertifyMe.net teaches laser safety in an easy, online format. Since their creation in the 1960’s, lasers have become increasingly prevalent throughout industry, medicine, metallurgy, mining, fabrication, entertainment, robotics and 3D scanning. It’s an exciting industry and makes for rewarding careers. Lasers are classified by the type of risk they pose. Class I: Considered safe, no specific safety requirements. Class I.A. : A special designated laser that is not intended for viewing (supermarket laser scanner). Class II: Low power visible beam that should not be stared at. The human eye will reflexively close fast enough or turn away before damage can be done. Class IIIA: Intermediate power, some limited controls are specified. Class IIIB: Moderate power and do not generally pose a fire hazard, and specific controls are recommended. Class IV: High power lasers that are hazardous to view under any conditions and are a potential fire and skin hazard. Significant controls are required. The employer is responsible for ensuring a safe work environment. The employee is responsible for complying with laser safety training. OSHA has created several standards for OSHA laser safety. Depending on the type of work you are doing, the type of eye protection needed can vary greatly. All areas of the workplace where lasers are being used should be properly and clearly labeled. Your employer must provide you with the Personal Protection Equipment (PPE) suitable for the work you are performing and must comply with all laser safety OSHA requirements, in addition to providing laser training. OSHA 1910.133(a)(1): The employer shall ensure that each affected employee uses appropriate eye or face protection when exposed to eye or face hazards from flying particles, molten metal, liquid chemicals, acids or caustic liquids, chemical gases or vapors, or potentially injurious light radiation. These safety practices are taught in laser safety training. OSHA 1910.133(a)(2): The employer shall ensure that each affected employee uses eye protection that provides side protection when there is a hazard from flying objects. Detachable side protectors (e.g. clip-on or slide-on side shields) meeting the pertinent requirements of this section are acceptable. OSHA 1910.133(a)(3): The employer shall ensure that each affected employee who wears prescription lenses while engaged in operations that involve eye hazards wears eye protection that incorporates the prescription in its design, or wears eye protection that can be worn over the prescription lenses without disturbing the proper position of the prescription lenses or the protective lenses. OSHA 1910.133(a)(4): Eye and face PPE shall be distinctly marked to facilitate identification of the manufacturer. OSHA 1910.133(a)(5): The employer shall ensure that each affected employee uses equipment with filter lenses that have a shade number appropriate for the work being performed for protection from injurious light radiation. 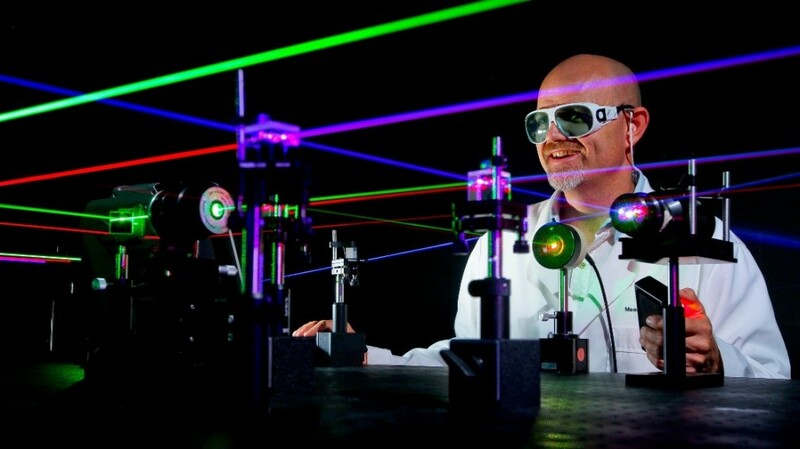 What Does CertifyMe.net’s Laser Safety Certification Teach? The laser safety training course was designed to meet all OSHA laser standards as well as follow the laser classifications on risks involved from the American National Standard Institute. Anyone in the medical, metallurgy, mining, fabrication, robotics, 3D scanning, or entertainment industries can benefit from our OSHA laser safety training. It covers the different situations in which lasers are used, along with any and all potential risks involved for each situation, including the dangers of fumes, gases, molten metal, chemicals and radiation. Students in our laser training course will be able to enjoy 24/7 online access from any device with an internet connection, in addition to free renewal training for life. Why are laser pointers dangerous? Direct viewing of the laser beam could be hazardous to the eyes, and will usually cause the victim to immediately shut his eyes. Imagine if you are a pilot and are temporarily blinded. This impairment can have dire consequences. Most cockpit laser strikes occur at low altitude when the airplane is most vulnerable during takeoff and landing. Don’t take laser safety for granted. Get proper laser safety training instead and be prepared to prevent catastrophes. Lasers are commonplace in industry, medicine, science, entertainment, aesthetics and the military, but no matter which industry they’re involved in, proper laser safety training is essential. The GLOBAL INDUSTRIAL LASER MARKET has experienced high growth over the past few years and it is predicted that the market will continue this growth through 2020. What Careers Use Lasers and Laser Processes? Optical Engineers: If you are looking for a career as an optical engineer, or electro-optical engineer, you should be excited by the opportunities in the field. Although a bachelor’s degree will typically get you started, a master’s degree may be required. There is a high demand for engineers in this field and starting salaries average around $83,000 per year. The growth outlook through 2024 is about 5%. Surveyor: Laser scanning in surveying is relatively new but commonplace. Pinpoint accuracy is necessary in architecture and land survey. According to the Bureau of Labor Statistics, median pay is about $58,000 per year and a bachelor’s degree is typically required, including laser training. Laser Technician: Careers are widely varied for laser technicians, ranging from medicine and ophthalmology to aesthetics and plastic surgery. Laser techs are typically supervised by a doctor or nurse, and attend vocational schools. These courses cover fiber optics and photonics (the study of light particles). It is recommended that you become an accredited laser technician by passing a laser safety certification program with the National Council on Laser Certification (NCLC). Lasers have so many amazing applications. They can both cut through the hardest steel and the most delicate human eye tissues. They provide so many benefits yet can be so dangerous. Lasers first came into being in the 1960’s and have brought with them opportunities for incredible innovation applications including 3D imaging, pinpoint accurate measurements, medicine and the military. Consequently, laser related injuries have been on the rise. The severity of any injury is related to the energy or power density of the beam and the absorption rate and length of exposure to the tissue. Unfortunately, there has also been a significant increase in injuries and the potential for catastrophic accidents related to misguided use of laser pointers in airline cockpits. Laser safety awareness is essential to increase public awareness of the hazards these pranks create. Although there are no U.S. mandatory laser safety protocols, the ANSI has created the Z136 standards for laser safety, and OSHA laser safety requirements are based on these standards. Awareness and laser safety training is crucial. The exponential growth in the number of laser applications and their importance is unquestionably one of the key drivers in the US and world economies. Employment in this field is expected to experience continued robust growth and offers high starting salaries. Responsible laser safety awareness is the key to ensuring a safe workplace. OSHA provides an easy tool for assessing PPE for use in the workplace at www.osha.gov/SLTC/etools/eyeandface/ppe/light_radiation.html#Lens Requirements. In addition to PPE, lasers and workspaces must be properly labeled to warn of the type of potential hazards and how to avoid them. If you work with lasers, these labels and placards are commonplace but don’t take them for granted. If you work with Class 3b or Class 4 lasers, your company must designate a Laser Safety Office (LSO) to oversee operation, maintenance, laser training and servicing. You could be subject to fines if unable to prove they provide adequate laser training. Have laser safety policies, rules and procedures in place and demonstrate that they are easily accessible by employees. Be able to provide the location, class and use of every laser in your facility. Provide a list of personal protection equipment (PPE) required for the lasers your employees are using and demonstrate compliance. Keep detailed training records at your fingertips. Have a laser accident response plan and show that your LSO is prepared for rapid response. Ensure your lasers are properly labeled according to federal standards. Require your employees obtain a laser safety certificate. Requiring that each of your employees become laser safety certified should be a key part of your laser safety program. It’s easy…Get started today. To meet OSHA laser safety requirements, CertifyMe.net has created a training course that teaches and certifies employees to work with lasers safely. The online laser safety certification program, which can be completed as an individual or as a company, teaches the various situations in which lasers are used and the hazards involved, like toxic fumes and gases, molten metal, chemicals, and radiation. The course is compliant with OSHA and the American National Standard Institute and their classifications for lasers. This means that employers and employees will receive the complete and most reliable education available. CertifyMe.net’s laser safety training is appropriate for those in the medical, mining, metallurgy, fabrication, entertainment, robotics, and 3D scanning industries, meeting all relevant regulations and standards. Employers who purchase the laser training course for their employees will receive free three-year renewals for life and printable proof with certifications for all workers. The online course is available 24/7 from any device with an internet connection, at the participant’s own pace. While providing all the topics laser industry workers need, it saves money and time for employers by eliminating the need to pay for off-site training in a facility. Create an account today and complete the laser safety training from CertifyMe.net in one afternoon! FBI press release, Laser Incidents Targeting Aircraft on the Rise Nationwide; Incidents Up 39 Percent in New York Last Year, dated February 11, 2014.